Melt 20g of the butter in a large heavy-based saucepan over medium heat. Add the onion and garlic and cook, stirring occasionally, for 4–5 minutes or until softened. Add the wine and cook for 2 minutes or until reduced. Add the rice and cook, stirring, for 1–2 minutes or until well combined. Gradually add the stock, 1 cup (250ml) at a time, adding more once completely absorbed, and cook, stirring frequently, for 20–25 minutes or until the rice is al dente. Remove the risotto from the heat and stir through the remaining butter and cheese. 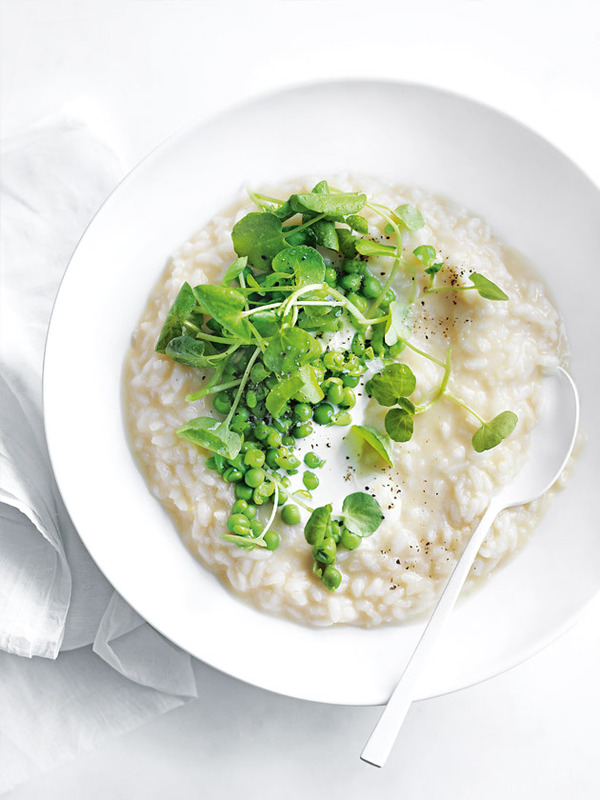 Divide between plates and top with the peas, crème fraîche, watercress, salt and pepper. Serves 4.